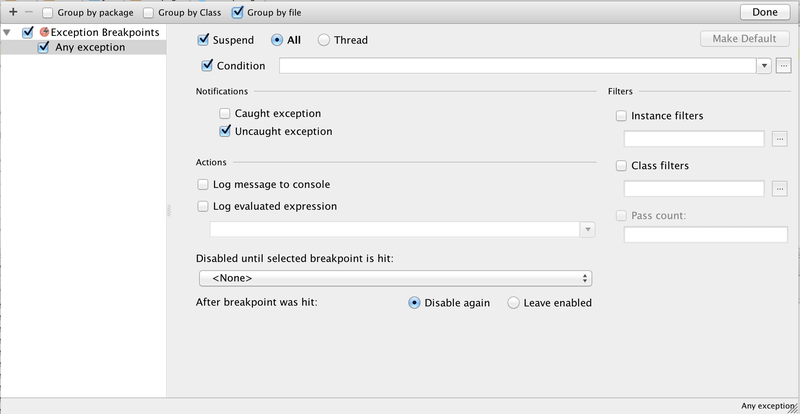 I'm developing plugin for IntelliJ and want to know how can I access the Exception Breakpoints panel and change its properties programatically. Hi, unfortunately there is no API for current breakpoints panels modification. What exactly are you trying to achieve? What I need is to enable Exception Breakpoints for uncaught exceptions ny default. Do you mean you want all new exception breakpoints to have "uncaught exceptions" checked and "caught exceptions" unchecked? Debugger stops at any uncaught exception with the configuration from the screenshot, doesn't it?